Lecture at the UNM Law School to shed light on "The Legal Labyrinth of Brexit"
The 2016 John Field Simms, Sr. Memorial Lectureship in Law will shed light on the political, legal and economic consequences about a matter that affects us all – Britian’s vote to leave the European Union. For the first time, a member state may leave the EU, creating a turning point in history similar to South Carolina’s session in 1860. What impact will Brexit have on the UK and the EU? Brexit is a labyrinth of new and complex legal procedures that may completely transform the constitutional history of the Western world. 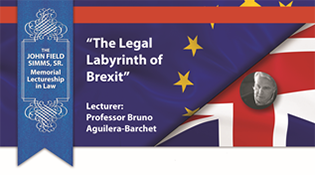 Professor Bruno Aguilera-Barchet of the King Juan Carlos University of Madrid will discuss "The Legal Labyrinth of Brexit" at 4:30 pm on September 7, 2016 at the UNM School of Law. This lecture is free and open to the public; parking at the event is free in the Law School “L” parking lot starting at 4:00 p.m.
Register online or RSVP to 505.277.8184. This endowed lecture honors the memory of highly respected trial lawyer John F. Simms, who had served on the New Mexico Supreme Court and as a University of New Mexico Regent.